Senator Elena Smith is the new President of country's most powerful union, the BNTU. That's the result that came out just a few minutes ago, and right now she is still doing her victory interview with the media, which we'll have for you a little later. But, first to the business of the 57th Annual BNTU Convention. 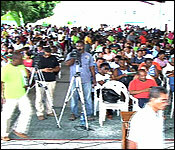 The two day event was held in San Roman, Corozal, at the Escuela Secundaria Technica Mexico auditorium. The main business was the election of a new executive. It's a big deal because for the first time in 9 years, the strongest union in the country will have a new leader after 3-term president, Luke Palacio, steps aside. 3 candidates stepped up hoping to take his place; they are Mario Mesh, the President of the Corozal Rural Branch; Troy Coleman, the President of the Stann Creek Branch; and Elena Smith, the serving Labour and Civil Society Senator with a 20-year membership in the union. It's been a long day for the teachers and our news team in Corozal, and it took a little over two hours to count the 630 votes. Counting started just after 4:00 pm, and just before news time Smith was declared the winner. You'll hear her victory interview shortly, but while that is finishing, we have snippets of the pre-election speeches that each candidate gave to try and win over the teachers. "As Mr. Brother Palacio steps down as president today, we must be thankful for him for dedication and a job well done. 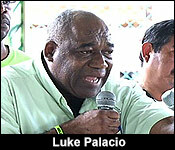 So we should applaud our brother and national president Mr. Luke Palacio." "The time has come now to elect a new leader, a leader who shall be the voice to protect, echo and maintain a proactive position on national issues, regional and international interest that will impact the overall development of this nation, especially the teachers. As an independent sovereign country, we know that what happens and what does not happened. We must now choose a new leader, a leader who shall fulfil all our memberships' expectations. A leader who can uphold the title of teacher and most importantly, the interest of BNTU as a union wholeheartedly. For this reason and more I, your humble servant have taken the opportunity to postulate myself as a willing, trustful and determine candidate to serve you in the capacity of national president." "As a current president and head teacher, I have learned to listen and comprehend the different needs and issues affecting our members. I fully understand that teachers support is vital for achieving our goals. Because of this we can all be proud that we are BNTU, the most respected union in this country." Now, here is our interview with Stann Creek Candidate Troy Coleman, and his explanation to us as the why the teachers should choose him. "I will not be Luke Palacio, I will be Troy Coleman and I will fight. I am a warrior. I will fight hard and I will fight smart, not only for the country of Belize, but for the teachers who are suffering injustices every day in the classrooms." 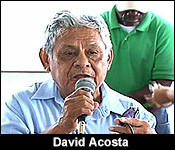 "I know for a fact that for many years we have been working to see how we can improve governance in Belize. How we can ensure that the people who we elect into government are able to be accountable to our people. We have fought a good fight. However now to balance that off we need to be more aggressive in our fight to ensure that the teachers who are suffering with issues to be taken care of. We need to fight that aggressively. For example, I can tell you there are teachers across this country who have not been getting increments for years. Increment is a yearly thing. Who is responsible for that? We need to find out and cut it off immediately and that is one of the things I want to fight. There are other issues. I feel that I am connected to my membership in the Stann Creek District, because I am one of those presidents who visits the schools. I visit my teachers where they work to see their conditions and that is the kind of leadership I want to bring to the BNTU; I want to visit my schools, I want to visit my teachers, I want to listen to their views, I want to listen to their issues and I want to connect with them. So that I know when I hear the name I can say oh this is the issue, I need to work on it. So there must be a connection. I think for a while there has been some level of disconnect between the leadership and the members of BNTU." "I have served my teachers. I will continue to serve my teachers. The only endorsement that is important to me in this endeavor is the endorsement from the members that have wish to serve after today. Everything else is not important to me at this time." "If you all elect me to be the next president of BNTU, I will ensure that together all of us, we will reach. What does that mean? We are going to re-energize our membership within our union. We were very strong a few months ago when we were on those 11 days of strike and I believe that as members of the strongest union in this country, that we must continue to have that energy. We must not give up that energy, we must never have a lull in our union, because that is the time when those persons you heard about this morning who are here for their political reasons, that's the time when they try to get among us. So we will not stay still." "I am going to work on us educating ourselves as members of this union. A lot of times we do not fully know what our rights are, because a lot of times people say that we don't like to read. We want to change that. I am going to ensure that we use technology, because we have a lot of young teachers here who are into technology and so we can reach them, we can help them to educate themselves by using the technological instruments that they themselves are aware of, that they themselves use." "I will also ensure, along with all my other members around the table, that our education committee becomes extremely active. That is an important committee, because if we have a functioning education committee our members can be educated and our committee can put forth training that you the members are asking for. What we will do will be based on what your needs are and what you ask of us. I am going to advocate for every one of you. It doesn't matter which branch you come from, it doesn't matter who you vote for, it doesn't what ethnicity you belong to. Through my strong leadership I will advocate for every member of BNTU." "You have known me for many years. I have been on my executive for 20 consecutive years serving on the Belize branch. I have been tried and I have been tested, but you can see today that I am standing, standing tall and I have nowhere to go from here, but taller, so it doesn't matter what they do. I will always be a member of BNTU and I will always work for you the members of BNTU whether I am in my branch or I am the president. So I ask you today members, give me your support. When you get in that line and you are going to elect your president, elect someone who is experience. Elect somebody who is knowledgeable. Elect somebody who has all of the abilities that they can move you forward." And that's the pitch that worked. Elena Smith was elected with the following count: Elena Smith 349 votes, Troy Coleman 147 votes, Mario Mesh 140 votes - meaning it's a landslide, she got more votes than her two opponents combined. "Share with us your first reaction to being elected as the new national president of the union you served for 20 years?" "I think the first word I must say is grateful. I'm grateful, I'm over joyed. Words can't express the feeling that I got. The support I got from my members it was so overwhelming that I don't know how to say thank you, but thank you to all the people who supported me." "Were you confident that you would get the victory today?" "I had some level of confidence, but I wasn't sure, because you never know - people might say to you 'I will support you' but when the days comes you don't know what they do or what they will do. So I wasn't over confident, but I was sure of my members from my branch." "You are the first president in 9 years I am told, does your election mean a shift from the Luke Palacio regime or what exactly does this mean? Do you intend to take the union a different route, do you intend to carry on his work? What's your vision for the union?" "Well first of all there is no Luke regime, it is the BNTU and it is what the members say is what our president and our council go by and so my plan is to continue to work with our members and to work with them and to do what it is that our members want. When I need to stand for them I will do that. When I need to work for them otherwise, I will do that. But it's not about me or brother Luke. It's about BNTU and our members. They will tell us how to go about doing their business." "What's the first thing you intend to institute? Do you have any ideas to pitch to your members to see if they will support your ideas as to how to improve the union?" "Well one of the main thing for me is communication and education and communication in the form of better technology. I think we need to be moving up with the century as - time is going by, we see that our younger people, our younger teachers are into technology. As a union we must become that as well for them so that we can benefit them. So my focus will be education and communication." "Now, when Mr. Luke spoke for the union, whether or not the persons in the public liked or hated him, whatever feelings they had against, the nation took notice of what he had to say, because he represented the strongest union. Do you foresee you have that ability to fill his shoes, to speak for the union whenever they take any positions whether or not it is adversarial to the government?" "I have no problems with that. As long as my membership give us the mandate. I will go by that. It doesn't matter who like it or doesn't like it - if the members say so, that's what I am going by. I am not afraid to speak and not afraid to stand up." "You've been part of the union for so many years now, you ran previously for this post and was defeated. How do you feel now actually winning this very important post?" "I feel that the extra years I took to qualify myself, and when I say qualify I don't mean papers and thing, but to get more experience I think has helped me and my members and the members of BNTU on a whole have seen where I have grown and they have seen that Elena Smith is about BNTU, not about any politics and I think that is what pushed me over the edge today." "Before the election, the council of management spoke about this infiltration for political interference, do you believe at the end of the day there is still infiltration of this political interference?" "I believe we do. We have seen persons, we have seen certain things happening, we have seen certain texts going around, we have heard of certain meetings and so there is a saying in creole 'if it sounds like a duck, quack like a duck, it is a duck" and so everybody is saying that was happening - it was happening." It was a landslide victory: Elena Smith got 349 votes, Troy Coleman got 147, and Mario Mesh got 140 - meaning she got more than they did combined. The 630 voting members is almost three times the number which voted in the last convention. Last night, the late breaking news at 6:30 was that Senator Elena Smith had been elected as the new National President of the Belize National Teachers Union. Our news team was still in San Roman Corozal. So, we only had the broad strokes of the annual convention which elected a new leader after Luke Palacio had reached his 9 year term limit. Hundreds of teachers showed up for the second day of their 47th annual convention to vote for their new National President. 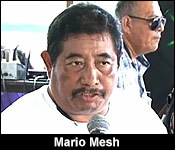 Their choices: Mario Mesh from the Host Branch of Corozal, Troy Coleman from Stann Creek, and the most well-known candidate of the 3, Senator Elena Smith. But the teachers, who had come from all over the country, were forced to sit around for more than a few hours, due to an emergency meeting of the Union's Council of Management. For the most part, the teachers were patient, if only a little put off by the lengthy delay. But, behind closed doors, the leadership of the union was in heated discussions about allegations of political interference. Supposedly, one out of two candidates were being backed by the ruling party, and political agents were allegedly campaigning on their behalf. 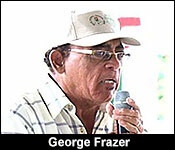 That emergency meeting appeared to have gone far too long for veteran George Frazer, and, in a fit of impatience, he took the mic, to tell his fellow union members that the day's business needed to proceed, and each candidate should be given his or her democratic right to contest for the leadership. "We see some political operatives...we shall not be moved. We want to have our convention proceed and go on according to the agenda. So, please, I will go over there and see what's happening. We need to get going." Shortly after that, he went to the meeting room, and less than 20 minutes later, the leaders came out, with the outgoing president taking the podium to explain the delay. "You heard the dirty remarks about sister Elena who is contesting for president. You heard the dirty remarks they have made about brother Mario Mesh and you heard the accusation being made also against brother Troy Coleman. All of these individuals are leaders of BNTU. Our concern is and has to be that if, and I use the word "if" they have been brought into a scene that none of them created. If they believe, whoever believe that they can muscle whoever becomes our president, they have a second guess coming, because you will not tolerate it. The members will not tolerate it." "You need to take a vote. You determine by your votes after this whether or not the elections should proceed." So, it was up to the membership to decide whether or not they would continue with the elections today, or if they would put it off to a later date. 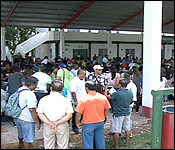 After an hour or so, the votes were in, and convention's decision was that the election should happen. As with each election cycle, all candidates for the different executive posts were given an opportunity to make a pitch to the convention. 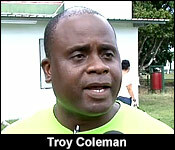 In the downtime before the campaigning started, we spoke with Troy Coleman. 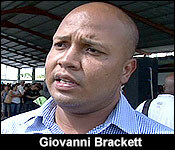 There was much talk among the teachers that he was the favorite of the PUP for the next BNTU leader. We pointedly asked him that. "They are suggesting that you have some sort of connection to the PUP. Can you share with us, do you have any sort of political affiliations or alliances?" "My brother, I have served my teachers. I will continue to serve my teachers. The only endorsement that is important to me in this endeavor is the endorsement from the members that I wish to serve after today. Everything else is not important to me at this time." We also tried to talk to the UDP's supposed favourite, Mario Mesh for a one-on-one interview, but he declined saying that he needed to be ready to speak to the teachers. He was referring the campaigning session for which he was due on the mic, and like Coleman, the only opinions he cared about were the teachers who would decide his fate. "We have been talking about political interference and I must admit just like you that we have fallen into that category, if not this election would have been over long time." "We must now choose a new leader, a leader who shall fulfil all our memberships' expectations. A leader who can uphold the title of teacher and most importantly, the interest of BNTU as a union wholeheartedly." The other two candidates were also trying to sway their union colleagues to support them instead. "You have known me for many years. I have been on my executive for 20 consecutive years serving on the Belize branch. I have been tried and I have been tested." "I am the kind of leader that will stand here and tell you that I will be nothing without you the soldiers of this mighty BNTU." So, after the campaigning was over, it was time for the teachers to do what they waited hours for: to select their new leader. They lined up according to the ballot boxes for their branches, and after an hour and half of voting, the election committee went off to a separate room to tally the numbers. There was the initial count, then 2 separate recountings, which took almost 3 hours to complete. At the start of news yesterday, the head of committee made an announcement of the final numbers. 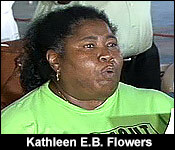 "Mrs. Elena Smith earned 349 of the votes. Mr. Troy Coleman earned 197 of the votes and Mr. Mario Mesh earned 140 of the votes." So, with such a landslide victory over the two candidates combined, Smith becomes the new President of the BNTU. She's now the face of the most robust union in the country, but she also becomes the lightning rod for criticism from all within the general public. She must be prepared to receive affection and political attacks upon her character, and the union she represents. "When Mr. Luke spoke for the union, whether or not the persons in the public liked or hated him, whatever feelings they had against, the nation took notice of what he had to say, because he represented the strongest union. Do you foresee you have that ability to fill his shoes, to speak for the union whenever they take any positions whether or not it is adversarial to the government?" Of the 686 teachers who voted in the convention 349 of them voted for Elena Smith. Troy Coleman got 197 votes - not 147, as we had reported; and Mario Mesh got 140 votes. Elena Smith still managed to get more votes than both of them combined, and she now takes over from Luke Palacio. But, while Palacio is no longer the head of the union, he still remains on the executive as the first vice president. That's because no other candidate stepped up to challenge him for that post in yesterday's convention. Jorge Mejia was also returned as the national treasurer because, again, nobody challenged him for the post. "I'd like to thank everybody who put their vote in me and their trust in me. I feel blessed today, but for me, first and foremost it's like I had said earlier is that the BNTU is the vanguard of our democracy and that is what we need to keep. For me that's first and foremost. After that if we keep that intact then we can do everything else which is taking care of our teachers, taking care of students, taking care of our nation. So for us that is what is important." "With this new executive the BNTU is strong or as strong as it was in October when it struck against the government?" "Of course, I believe that all these tests make us even stronger and bring us even more united, because instead of what they are attempting which is to break us apart, it is causing the opposite. It is bringing us together. This family has gotten stronger, the support is even bigger and that - maybe I should thank the government for having done what they did, so that it can strengthen us even more. We will continue doing our work, the government needs to continue being very watchful, because we will not stop protecting and looking over our children, our teachers and our Belizeans." So, as you saw in our story, the teachers placed a lot of emphasis on what they strongly believed was political interference designed to manipulate their union. "We didn't want to be up here, because we believe that we could support from afar. But it's very simple, the government has interfered within this election. I have gotten calls about this election over the last few weeks, try to ignore it. The latest reports that I have gotten is that there had actually meetings within the different parliamentarians within the government who have met with teachers and have gone to having a strategic orchestrated move to get their candidate elected here." "This union, the Teachers Union has shown over the past few years that they are the strongest entity within the NTUCB. It is in the best interest of the United Democratic Party, if they want a fourth term, to have to break the backs of the unions. So we have come out here simply to show our support for freedom in this election that freedom free from political interference. We have our candidate that we support, but we believe that it was necessary for us to come here, Mr. Rivers and I to show face and to observe. Because we thought that they would have actually have some supporters out here to make mischief, but we know they have supporters in green shirts. So we just came out here to show support and solidarity with the past executive president and support whoever will be the new elected president." "So you are not here to play favorites with any of the 3 candidates?" "Well I won't lie, I have done a polling within our organization and majority of our people has already selected and they support Elena Smith. They believe her record and that she is a fighter, not just for teachers, but on the issues that affect this country and so I am not afraid to say that majority of the members within COLA executive is in support of Elena Smith." 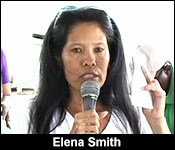 That interview was granted hours before the teachers had elected Elena Smith. So, with her selection, COLA should be pleased that their favoured candidate is now leading the BNTU. 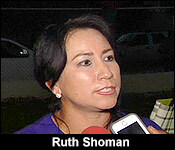 Smith's victory is also being celebrated by the Belize Progressive Party. They sent out a statement saying, "(BPP... takes this opportunity to congratulate theâ€¦ (BNTU) on hosting a successful convention, which saw a smooth transition of leadership... The BPP anticipates that the advocacy and... actions which have become synonymous with the BNTU, shall continue under the leadership of the new President, Senator Elena Smith." End quote.